So far this off-season, life has been pretty good for New England Patriots fans. The Patriots made arguably the signing of the season when they brought in Brandon Lloyd, the team's defense added two of the most talented defenders from college to their defense through the draft, while former offensive coordinator Josh McDaniels returned to the team(although, technically that happened during last season). Probably the most uplifting news for Patriots fans occurred yesterday though when news broke that Logan Mankins was to return to practice. Mankins' mysteriously tore his ACL during last season despite not missing any time on the field. Mankins had not missed a single practice in his seven year career and he had developed into a key player for the Patriots over the years. With the team losing Matt Light this off-season, and replacing him with a very young albeit talented player, the Patriots needed Mankins for his veteran presence as much as his quality play. After Robert Gallery suddenly retired last week, the Patriots' prospects on the line were worrisome at best. However, with Mankins back in the mix, they can at the very least lock down three of the team's starting spots now. Both tackles, Nate Solder and Sebastien Vollmer, as well as Mankins at left guard, means that the Patriots will just need to figure out who will line up at right guard and center when the season begins. Even though Mankins is back, it is still unclear whether Brian Waters will return to the team or declare his intentions to retire. The Patriots' offensive line has been the talk of the off-season recently. 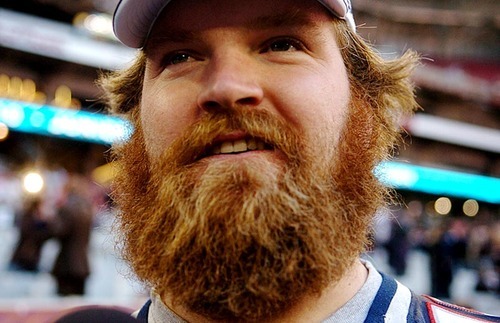 With Mankins returning, that talk could begin to dissipate, just in time for Tom Brady too.